Bandwidth Management « Global Market Insights, Inc.
IoT in healthcare market has been forecast to witness remarkable growth prospect in the years ahead, subject to the robust enhancements in healthcare infrastructure. Digitization, having paved its way toward healthcare, has prompted numerous hospitals and regional governments to undertake initiatives to deploy IoT in the healthcare sector, owing to the rise in the requirement for mobility and communication in medical care. With the implementation of IoT facilities, healthcare service providers may be able to deal with the challenges related to consumer data sharing, since this technology is highly capable of dealing with patient data operations very efficiently. The emergence of the internet of things has significantly impacted the overall IoT in healthcare industry trends since the last few years. Statistically, in 2016, IoT in healthcare market held a revenue of more than USD 2 billion. Nowadays, medical research institutes and healthcare product manufacturers have been joining hands to accelerate digitalization across the healthcare sector by deploying technologically advanced digital health products. For instance, Oxford University and National Institute for Health Research (NIH) have signed a five-year agreement with the London based giant in IoT in healthcare market, Drayson Technologies to build and commercialize digital healthcare tools. Through this research agreement, the Oxford Biomedical Research Center aims to deliver excellent benefits to patients from hospital to the comfort of their homes. For this research and development program, NIH has provided funding to Drayson Technologies, which also raised USD 53 million from several other funding agencies. Recently, the integration of the internet of things with artificial intelligence (AI) has changed the outlook of healthcare institutions, having fortified medical care data maintenance with improved storage capability, robust connectivity, and high security. The well-known participants in IoT in healthcare market are also focusing on AI-based IoT healthcare facilities. For instance, IBM has recently developed an AI system for hospitals that will help to carry out tedious tasks much more efficiently and flawlessly than humans. In fact, IoT has helped bring about a paradigm shift in healthcare, subject to the introduction of smart devices that help provide and secure patient data. IoT also enables doctors to get in touch with patients staying in remote areas very easily through video conferencing, on account of which patients can eliminate the need for routine checkups. With numerous benefits under consideration, healthcare professionals are increasingly adopting IoT systems, which is certain to have a positive impact on IoT in healthcare industry. The stand taken by regulatory bodies and regional governments have also influenced IoT in healthcare market outlook considerably. In fact, it has been observed that governments have been pressurizing healthcare centers to implement IoT, on the grounds of which numerous hospitals and clinics have deployed IoT technology to maximize patient comfort. In addition, many countries have commenced smart city programs incorporating healthcare IoT projects, which would also push IoT in healthcare market share. For instance, the Singapore government has collaborated with Intel and Dell to deploy the Internet of things for eldercare patient pilot project at the Saensuk Smart City. The large-scale deployment of smart city projects across several other countries will further stimulate IoT in healthcare industry size over the years ahead. In the future, the integration of IoT in healthcare facilities is likely to increase the possibility of operating analytical tools and maintaining electronic health records. 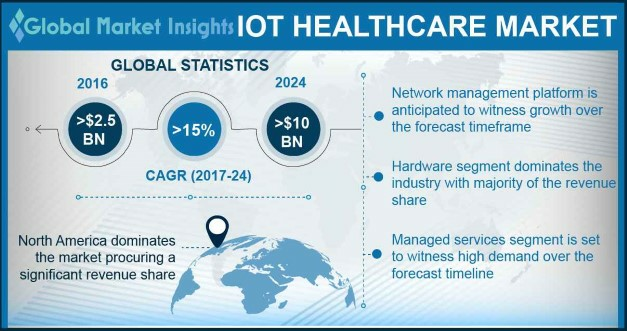 The growing renovation of established healthcare facility centers is another major factor that will push IoT in healthcare industry size, slated to cross USD 10 billion by 2024. This entry was posted in Sustainable & Smart Technologies and tagged Application Management, Bandwidth Management, Connectivity Technology, Data Management, Device Management, Inventory Management, IoT Healthcare Market, IoT in Healthcare Market, IoT in Healthcare Market Size, Network Management, Remote Monitoring, RFID, Security, Sensors, Streaming Analytics, Telemedicine. Since its conception, IoT has been impacting numerous businesses in unprecedented ways than expected. IoT infrastructure market, one of contemporary niche verticals of the building construction and infrastructure development sphere, now holds the reputation of being encompassed among the many IoT influenced business spheres. The proliferation of the Internet of things in infrastructure development has led to the procreation of smart homes and cities, touted as a revolutionary phenomenon of the 21st century. With the rising demand for connectivity to enable smart security, social surveillance, smart transportation, energy safety, smart metering, and efficient governance for enhancing consumer lifestyle, IoT infrastructure industry is likely to garner much acclaim in the ensuing years. 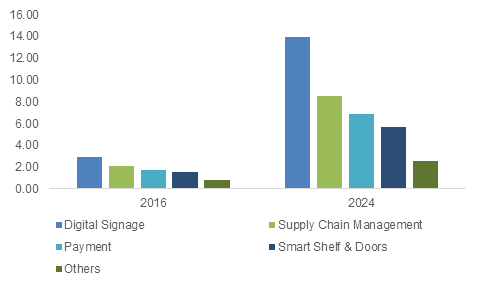 Estimates compiled in a recent IoT infrastructure market research report forecast this business space to have accumulated a valuation of close to USD 15 billion in 2016. The proliferation of IoT in the home sector has brought about a barrage of changes in consumer standard of living. IoT-enabled homes offer some of the best advantages that can transform a person’s lifestyle across the urban space. Smart devices such as the Nest thermostat, Amazon Echo, smart fridges, Google Home, Wink Relay and Controller, etc., have been popularized across IoT infrastructure market and liberally deployed in smart homes, subject to their incredible benefits such as controlled energy consumption, automated notifications, weather alerts, etc. Fiercely vying with one another to consolidate their positions in IoT infrastructure industry, tech companies have been going the whole hog to introduce highly advanced connected devices for smart homes. The deployment of big data and IoT in smart buildings helps deliver actionable insights to improve consumer living comfort, optimize building operations, and reduce energy expenditure. The robust rise in the number of connected devices being installed in smart buildings bears evidence to the fact that IoT infrastructure industry share from smart buildings is likely to plummet in the years ahead. Companies have been planning strategies to brainstorm numerous connected devices for exploiting the potential of IoT in buildings. Recently for instance, Kone signed on a multi-year deal with IBM, with an aim to maneuver the IBM IoT Cloud Platform for connecting, monitoring, and optimizing building components such as doors, elevators, turnstiles, and escalators. A recently compiled report depicts that close to 60% U.S. citizens prefer living in smart cities, given their incredible advantages. The rising proliferation of smart cities is evident from the incredible proportion of smart city projects that are being undertaken across myriad geographies – which may have a mammoth impact on the revenue graph of IoT infrastructure industry. 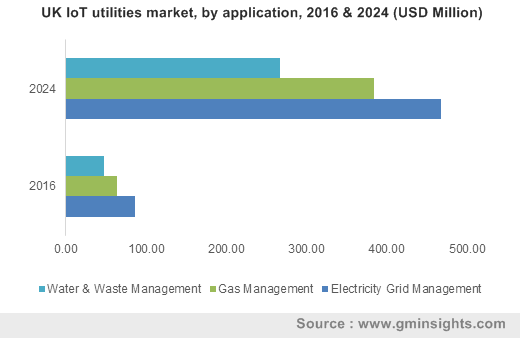 The numerous advantages provided by smart cities with regards to planning, finance, energy safety, transportation, and other urban aspects have accelerated their demand and popularity across IoT infrastructure market. In consequence, tech behemoths have been signing public-private partnerships, that would lead to the generation of layered framework to address the many challenges of smart city projects by building effective, connected solutions. The Internet of Things, conceived back in the 1980s at the Carnegie Mellon University, has now metamorphosed into a prodigy that defines efficiency, sustainability, and convenience. The deployment of this concept in infrastructure is likely to open up a plethora of opportunities for construction companies, real estate developers, technology behemoths, and infrastructure development firms, that would strive to brainstorm numerous solutions for connected infrastructure, augmenting IoT infrastructure industry trends. 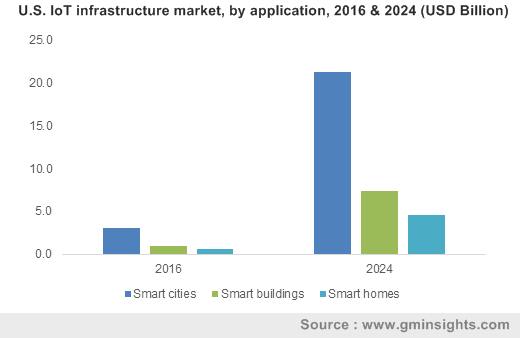 An IoT related report by a research firm claims close to 1.40 billion IoT units to be shipped ahead for smart city projects by 2020, for smart homes, smart buildings, smart transportation, sustainability and climate change. This provides ample evidence to the fact that IoT infrastructure market is here to stay, boasting of a widespread array of technologies, platforms, and applications. A report compiled by Global Market Insights, Inc., claims IoT infrastructure market size to surpass a valuation of more than USD 130 billion by 2024 – which is apparently close to 8.5 times its value in 2016. This entry was posted in Sustainable & Smart Technologies and tagged Application Management, Bandwidth Management, Connectivity Technology, Data Management, Device Management, Internet of Things in Infrastructure Market, IoT Infrastructure Market, IoT Infrastructure Market Share, IoT Infrastructure Market Size, IoT Infrastructure Market Trends, Network Management, Remote Monitoring, RFID, Security, Sensors, Smart Buildings, Smart Cities, Smart Homes, Streaming Analytics. The deployment of IoT in retail market has indeed given rise to a more convenient, smart, and tremendously efficient experience for retailers and consumers. With connected solutions transforming the retail sphere, companies offering IoT and retail solutions have been partnering to provide an all-round, reliable, connected experience to global retail consumers. Demonstrating an instance of this fact, Fujitsu has scarcely collaborated with Arkessa to deploy connected retail and IoT solutions to customers. Through this partnership, Arkessa, a global M2M managed services provider specializing in easing IoT connectivity, plans to enable its ICT solutions for retail, thereby helping Fujitsu’s retailers deliver a first-class consumer experience. The partnership is one of the many alliances that underlines the extensive developments prevalent in IoT in retail market, which, as per analysts, generated a valuation of close to USD 9 billion in 2016. As per a recent research study, the Internet of Things is one of the most paramount trends emerging in the retail space. The scope of IoT in retail industry travels beyond the frontiers of modest customer satisfaction and retailer convenience, as it provides consumers with high-grade browsing service, digitized real-time coupons & offers, and an overall, sophisticated, connected shopping experience. Additionally, retailers are rewarded with smart store operations, smart pricing strategies, and smart inventory management, which enables further deployment of smart solutions in store, thereby fueling IoT in retail market share. In the middle of September 2017, an LA-based IoT technology provider, Mojix, announced a merger with CXignited, a European IoT firm, with an intent to create a global connected solution providing platform that would help retailers and brand owners boost their consumer experiences and automate their inventory management procedures. The joint entity is slated to be operating under the individual brand names, and is certain to have a considerable impact on IoT in retail market share. Merely a few days post the Mojix-CXignited JV was announced, the renowned France-based fashion retail giant, Kiabi, declared the onset of a technology alliance with one of the world’s most trusted and reliable IoT device management solution providers, Soti. Kiabi’s intent behind the supposed runway ready collaboration was to exploit Soti’s integrated mobility platform for its stock transfers, delivery processing, and inventory control. The retailer’s alliance with Soti is remnant of how robustly IoT in retail industry has been making rapid inroads onto the path of success. The onset of October witnessed IBM’s cognitive AI platform, Watson, helping Indian retailers to decode consumer behavior and reach out to the most appropriate target audience. IBM thus, directs Watson to analyze data collected via IoT sensors, and collect insights for forecasting and upgrading the performance of machines and components to deliver tailor-made solutions to clients. IBM’s move to exploit IoT for the Indian retail space is one of the most dynamic instances depicting the vast expanse of IoT in retail market. Accurately defined as one of the top retail technology trends to look out for, the Internet of Things has been drastically disrupting the traditional retail business model, which has had a commendable impact on IoT in retail industry. Traditional retailers, in a bid to attract consumers and consolidate their stance, would have to live up to numerous challenges, in response to which they would need to keep abreast of the latest technologies influencing the retail sphere. This would subsequently have a massive impact on IoT in retail market outlook, given that retailers would desperately sign up to exploit connected solutions for their brick-and-mortar stores. In effect, retailers have been looking forward to outwitting their rivals when it comes to offering the choicest, most unique, comfortable, and tech-savvy retail experience for customers, which would single them out in IoT in retail market. Analyzing the depth to which IoT is being leveraged by retailers, it can be aptly presumed that IoT in retail industry would traverse a rather successful path over the forthcoming seven years. This entry was posted in Sustainable & Smart Technologies and tagged Application Management, Bandwidth Management, Connectivity Technology, Data Management, Device Management, Digital Signage, Internet of Things in Retail Market, IoT in Retail Market, IoT in Retail Market Size, IoT Retail Market, IoT Retail Trends, Network Management, Payment, Remote Monitoring, Retail IoT Companies, RFID, Security, Sensors, Smart Shelf & Doors, Streaming Analytics, Supply Chain Management. 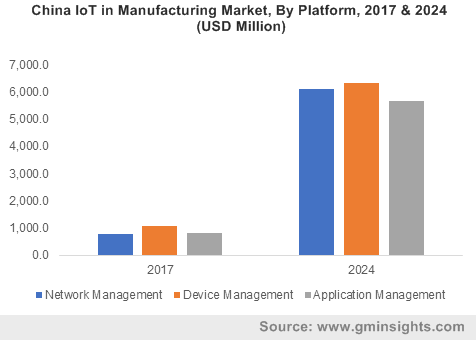 The scope for IoT in manufacturing market has been on a tremendous high lately, owing to the massive deployment of IoT devices in numerous manufacturing operations for enhancing industrial productivity and working efficiency. The ongoing developments across numerous industry verticals stand testimony to the aforementioned fact. Recently, the Japan based conglomerate Hitachi, and the automotive giant Toyota inked a partnership to develop a high-efficiency production model using an IoT platform. The partnership intends to exploit Hitachi’s Lumada technology and artificial intelligence across all the manufacturing operations. Incorporating big data with AI has been touted to improve the quality and production efficiency of manufacturing companies, pertaining to the capability of IoT devices to provide real time information and feedback. In recent years, the advent of advanced digitalization and the prevalence of diversified customer requirements have changed the mindset of manufacturers toward the adoption of advanced technologies. In a bid to fulfill the growing demand for consumer products, manufacturers have been attempting to upgrade their production efficiency several notches higher, through automation and the internet of things, which would have a favorable impact on IoT in manufacturing industry share. Statistics, as a matter of fact, claim that in 2016, worldwide IoT in manufacturing market collected a revenue of USD 20 billion. With an aim to comply with the critical advancements in the technology cosmos, IoT in manufacturing industry players have been developing novel products incorporated with IoT sensors for various sectors such as the automotive, consumer goods, chemical, and electronics. Acknowledging the numerous benefits of the Internet of things, several key players in IoT in manufacturing market have been attempting to brainstorm products that would have an appreciable influence on the overall business landscape in the ensuing years. Some of the renowned firms striving to augment the profitability landscape of IoT in manufacturing industry are Microsoft Corporation, Zebra Technologies, Rockwell Automation, PTC Inc., IBM Corporation, Huawei Technologies, Bosch, Siemens AG, Intel Corporation, Schneider Electric, and Cisco Systems. Currently, many manufacturers have already deployed IoT systems in their workflow to increase their functionality via predictive maintenance, track assets in their factories, and combine their control rooms. The shifting focus of manufacturing behemoths toward the deployment of more advanced technologies such as augmented reality (AR) and robotics is slated to fuel IoT in manufacturing industry size. The digital transformation in the manufacturing sector has been forecast to generate new opportunities for various end-use industries such as automotive, electronics, consumer goods, etc., subject to the intensive networking customers through IoT. Considering the benefits of IoT, many manufacturing giants have been collaborating with internet companies, as is witnessed across IoT in manufacturing market in recent times. For instance, National Instruments Alliance partner Averna has announced a partnership with PTC to expand its reach from testing to manufacturing via IoT. Many other companies have also been increasingly adopting connectivity technologies such as WiFi, M2M, and industrial networks to link plant automation assets such as RFID and robots to end user applications like PLM, ERP, and MES for more precision, which would undeniably have a major impact on IoT in manufacturing market share. This is quite evident from the estimates – IoT in manufacturing industry size has been forecast to cross a valuation of close to USD 150 billion by 2024. This entry was posted in Sustainable & Smart Technologies and tagged Application Management, Bandwidth Management, Connectivity Technology, Data Management, Device Management, Industrial IoT Market, Internet Of Things in Manufacturing Market, IoT applications in Manufacturing Industry, IoT in Manufacturing Industry, IoT in Manufacturing Market, IoT in Manufacturing Market Size, IoT in Manufacturing Sector, Network Management, Remote Monitoring, RFID, Security, Sensors, Streaming Analytics.